He has a very high SGPT. He had his laboratory exam on November 27, 2017. And the result is 990. The normal SGPT result should only be 5 to 35. 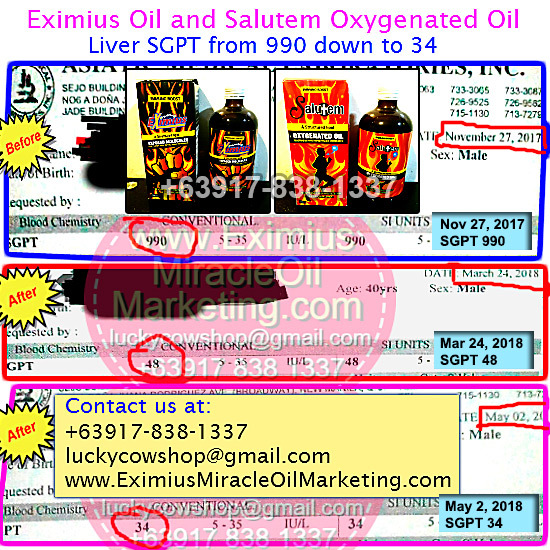 He took Salutem Oxygenated Oil and Eximius Oil. On March 24, 2018, his SGPT result went down to 48. He continued taking both Salutem Oil and Eximius Oil. And on May 2, 2018, his SGPT is now in normal range which is 34. Here's the compilation of his SGPT result. If you know anyone who has a high SGPT on their laboratory result, or has other health problem, do share this post to them. Our supplement maybe able to help them.